Keisuke Nagi and Kazuki Nakayama in Soga Shohaku. Photo by Taisirou Satou. BOTTOM LINE: A play exploring the life and inner world of the eccentric and rebellious 18th-century Japanese painter Soga Shohaku. 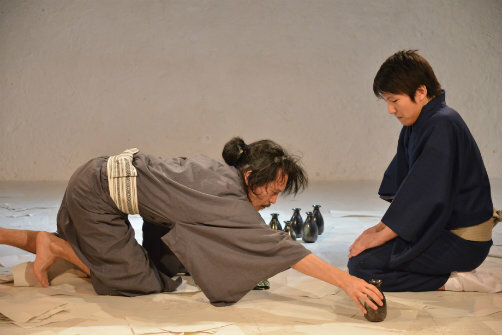 If you like paintings and artworks, you will like this play performed by the Japanese theater company LiveUpCapsules. Told in segments of short stories, Soga Shohaku explores the little-known life of a controversial painter who lived in Kyoto, the center of arts and noble class activities during 18th-century Japan. For context, Shohaku ((1730–1781) is overshadowed by other schools of painters, particularly the Kano school. The Kano school was strongly influential with a large body of disciples; following old Chinese schools of paintings, they emphasized imitation of the master. Shohaku is also overtaken in popularity by the new, naturalist painter Maruyama Okyo. Okyo's work has western naturalist influences, and he made careful, realistic representation of his subjects after long periods of observations. Shohaku, on the other hand, according to writer/director Yuko Murata, paints from his soul. His contemporaries regarded him as a crazy man. He is notorious for his eccentric treatment of conventional themes. With a few broad, animated brushstrokes, he depicts the spiritual essence of his subjects, often with an air of grotesque or bizarre that shocks its viewer. His paintings never fail to shock. His 35-foot-tall “Dragon and Clouds”, now displayed at the Boston Museum of Fine Arts (they own fifty of Shohaku’s paintings from the William Sturgis Bigelow collection, acquired in the early 20th century), and shown as one of the slides during the play, depicts a demented dragon laying low, with inquisitive eyes. Shohaku was an individualist and visionary before the world understood these concepts. He saw and painted by impression, through the eyes of an artist, not a craftsman. He was honest and true to his voice, but that was difficult to come by in ancient Japan. Perhaps to a certain extent, this still applies to modern Japan. His paintings are full of energy, and his characters, vibrant, deeply felt, and revolutionary. Keisuke Nagi plays Soga Shohaka with an eccentric and erratic energy. Kazunori Tezuka and Yuko Yamazaki play several characters as well as good friends of Soga Shohaka with warm, pleasing personalities. And Kazuki Nakayama plays a multitude of characters with poise and effectiveness. The set is simple and quiet, like the Japanese aesthetic, it uses white as a part of the painting. The effective lighting is by Ayumu Saegusa. I can’t wait to see this realized elsewhere in New York and the United States: in a bigger space the whiteness would envelop the audience, and provide more canvas for Shohaku’s powerful brushstrokes and wonderfully detailed paintwork to flourish.